Just 30 minutes north of Port Douglas is the magnificent Whyanbeel valley (named after the local Aboriginal name for "Canoe"). Located on the edge of the World Heritage-listed Daintree Rainforest, the Whyanbeel Valley is a little piece of paradise tucked away against a lush backdrop of rainforested hills. To reach it follow the turnoff to the small community of Miallo, that will take you along a scenic route past sugar cane farms, clear-water creeks and exotic fruit farms into the beautiful Whyanbeel Valley. 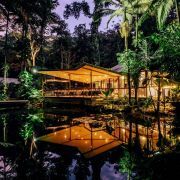 A popular site for executive retreats, holiday homes, artists, and amazing tropical gardens; this peaceful valley also offers some interesting and different things to do with Daintree Station adventure park, Hoglund Art Glass Studio and High Falls Riverside Restaurant situated in the area. Janbal is a private luxury rainforest retreat built with a love of nature and luxury, that accommodates up to six people. Janbal rests on 27 acres of untouched pristine wilderness and is one of the larger blocks remaining south of the Daintree. A short or long stay will give you an understanding and awareness of this precious eco-system, its beauty and challenges. Not recommended for children under 12 years. Just 10 minutes drive from Port Douglas is the beautiful Mowbray Valley. The Mowbray Valley was the hunting ground for the Chabbuki (Tjapukai) tribe of aborigines who moved through the valley on hunting trips between Port Douglas and Mona Mona camp near Kuranda. The pyramid-shaped Black Mountain is a prominent feature of Mowbray National Park. Black Mountain Road runs through both Kuranda and Mowbray national parks, as well as State forest and private land, and offers a rough and scenic alternative south-north route to the Cook Highway (suitable for four-wheel-drive vehicles only). The famous Bump Track - an old mining road is popular with bike ride enthusiasts. The track leaves from Black Mountain Road and concludes in the Mowbray Valley, where you will gain a true appreciation of the rainforest. The Port Douglas Valley Retreat is nestled beneath the prominent landmark, Black Mountain, at the head of the picturesque Mowbray Valley, just 10 minutes from Port Douglas. Port Douglas Valley Retreat is nestled beneath the prominent landmark, Black Mountain, at the head of the picturesque Mowbray Valley. Accommodation is presented as a traditional ‘Queenslander’ featuring wide verandahs, high ceilings and extensive use of local timbers. 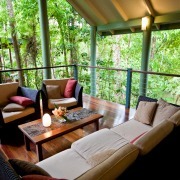 Comfortably sleeping 7 guests in quiet rainforest surrounds. The sugar town of Mossman lies just 20 minutes north of Port Douglas. This small, typical North Queensland town is set amongst fields of cane sugar, with a lush green backdrop of the Daintree National Park. The town was built around the Mossman Sugar Mill (established in 1894), and is now the region's sugar capital that hums its way through cane crushing season (June-October). Explore the country stores and historic pubs in the tree-lined main street, or take a wander around the lovely weekend markets that are held every Saturday beside the old stone church, underneath the Raintrees. Mossman is also well known as the gateway to the refreshing and beautiful Mossman Gorge. This very accessible and scenic section of the World Heritage listed Daintree National Park is well worth a visit. Here the Mossman River tumbles its way over huge granite boulders that line the gorge, creating cool clear freshwater swimming holes. Follow along rainforest tracks, cross the suspension bridge and take the 2.7 kilometre rainforest loop trail. 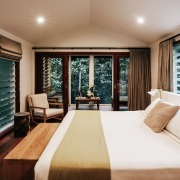 Silky Oaks Lodge & Healing Waters Spa is located just downstream from Mossman Gorge and offers complete privacy within a stunning location, just a short drive from Port Douglas. This luxury boutique hotel lodge and Healing Waters Spa consists accommodates 50 River and Treehouse Cabins set amongst spectacular rainforest and lush natural gardens. Each timber cabin features wide verandahs and luxurious spa baths, ideally suited as a couples getaway.The Healing Waters Spa is a winner of the World Luxury Spa Awards - 2011. Drawing on the spirit of the Daintree, the Spa is designed with renewal, vitality and well-being in mind. Janbal Gallery is a special place where you can experience Aboriginal Art and culture through hands-on painting and storytelling. 100% Aboriginal owned and operated, Janbal Gallery was established at Mossman in 2008 by local Aboriginal artist Brian “Binna” Swindley. Take part in an art workshop and paint your own Aboriginal boomerang, didgeridoo or canvas or simply browse through the gallery, learn about Binna’s mother, Shirley “Janbal” Swindley and Binna’s signature Yiki People. All of the art works for sale at Janbal Gallery are one off originals, hand painted by Binna at Janbal Gallery. Janbal Gallery is open to the public from 10am – 5pm Tuesday to Saturday, 5 Johnston Road Mossman. Shannonvale Winery makes award winning wines from Tropical Fruit, ranging from very dry wines to Ports that are all of commercial standard. The wines are single-fruit wines, not blends and are not sweet and sticky. All the fruits have big flavours and are grown organically in the Shannonvale orchard. Located on Shannonvale Road, visitors are welcome to view the orchard and learn about the tropical fruits, plus sample a tipple or two. Hoglund Glass Blowing Studio is nestled in the Whyanbeel Valley, 30 minutes drive north of Port Douglas. Established in 2002, the 'Jungle Studio' is home to the World-renowned glass artists Ola & Marie Höglund. Hoglund Art Glass Studio is open to visitors from the end of May through the winter months where you will find a stunning collection of handblown and unique vases, bowls, platters, goblets, perfume bottles, paperweights, little glass birds and handmade glass jewellery. Situated at 580 Whyanbeel Road towards the end of Whyanbeel Road. High Falls Riverside Restaurant is located on a secluded private property in the Whyanbeel Valley. Here you will find an abundance of exotic tropical fruit and a delightful riverside restaurant which has a fabulous timber deck overlooking Wynanbeel Creek. The self guided orchard tour, fruit talk and tasting is what most guests enjoy on a visit to High Falls Farm. The fruit orchard was built over 25 yrs ago and comprises of over 70 different types of rare fruit trees from all over the world. Open 1st June until 31st October, Friday to Tuesday from 11.30am - 2.30pm and Sunday breakfast from 8:30am. Daintree Station is a fun adventure park that brings a little taste of outback Australia to all visitors. Nestled in the foothills of the Whyanbeel Valley, the stunning backdrop of the Daintree rainforest greets visitors to this beautiful cattle station. The Jungle Rumble Quad Bike Adventures and Giddy Up Horseriding make for an exciting adventure the whole family can enjoy. The station's fleet of muster quad bikes are easy to ride around the old Rainforest tracks. Minimum age is 10yrs. Meanwhile Giddy Up Horseriding offers a small personalised ride through the Daintree Rainforest and surrounding property at Daintree Station, with experienced guides ensuring your safety & comfort. Suitable for all riders from 6 years +, beginners to advanced. Daintree Station makes for a fantastic wet weather option with exciting water crossings, rainforest tracks and more. Daintree Estates chocolate is the first commercially produced chocolate to be made from cocoa beans grown in Australia. The cocoa plantations are located in the Mossman area next to the Daintree Rainforest, where the climatic and environmental conditions are just right for growing cocoa. Chocolate lovers can visit the Daintree Estates stand at the Port Douglas Sunday Markets to get a taste of this award winning chocolate. Regular chocolate tasting sessions also take place at the Cairns Domestic Airport and Mossman Gorge Centre. See if you can resist the temptation to keep this one a secret! Mossman Gorge is home to the Kuku Yalanji people, the area's traditional Aboriginal landowners. Here you can take a guided Dreamtime Walk which will give you a rare insight into the special relationship the local indigenous people have with the rainforest. The Ngadiku Dreamtime Walks are conducted by the local Indigenous people - Ngadiku (Nar-di-gul) means stories and legends from a long time ago in local Kuku Yalanji language. Journey along private, gentle tracks, visiting special places and culturally significant sites, past traditional bark shelters and over meandering cool rainforest streams. The Bump Track, a feeder track for the Bicentennial National Trail, is a multi-use track open to horses (permits required) and mountain bikes as well as walkers. It traverses Mowbray National Park between the coastal lowlands and Black Mountain Road. Passing through rainforest and eucalypt forest with some steep sections, the track offers views of Big Mowbray Falls and the Mowbray River mouth. You will also see Mowbray Falls in the distance as you walk along the track. Take on the famous “Bump Track” half day (or extended) with Back Country Bliss tours - one of the ten best mountain bike rides in Australia.